The Riviera Maya starts in Cancun and goes all the way to the Sian Ka'an Biosphere. South of that is the Costa Maya which is another wonderful place that many overlook. North and west of the Riviera Maya is the entire Yucatan Peninsula which holds so many treasures you may not know exist when you are planning your Caribbean vacation in Mexico. Here is a short overview of what there is, why you may want to add to your vacation plans, and why one visit isn't enough. And locals living here—don't forget you live in paradise; take some time to enjoy these places for a short getaway or day trip. Assuming you land in Cancun, the first thing is where to go. You can head to a number of islands: Isla Mujeres, Cozumel, Holbox. All quaint, and some more pristine than others. Cozumel is the largest and busiest, thanks to the cruise ships that visit here, but it is also home to some incredible diving. Isla Mujeres is an easy day trip from Cancun and a world all to itself. Boasting one of the best sunsets on its North Beach, it is a quieter place to come and relax and, with its sunken sculptures, is another great spot to dive. Holbox is a favorite for those who want to snorkel with the Whale Sharks or seriously get away from the hustle and bustle of tourist towns. Choose Holbox or head to the southern-most tip of the Costa Maya to find what life on the Caribbean Coast used to be like—they are places where time stands pretty still. Island life isn't your choice? Then let's head south from Cancun. First stop would be Puerto Morelos. Once known as a quiet little fishing village, it is now a thriving seaside community but what sets it apart is the diversity of the community and their success in protecting its natural resources! It is a Protected Marine Park and we congratulate those who had the vision and passion to make this happen—local Mexican/Maya and expatriates living and working together to make this a very unique and sustainable place. If you choose Puerto Morelos, we recommend you rent a car and take some time away from the gorgeous beaches with their white sand and turquoise waters, and venture down the Ruta de los Cenotes. There are a number of great places to explore caves and cenotes that are not as touristy as the places the all-inclusive resorts will recommend. We had a wonderful time exploring Cenote 7 Bocas and met the most wonderful family. It is rustic but well worth the visit. Farther on you will come to Boca del Puma which is a fabulous eco-park that was carved out of the jungle by the most amazing man, Jesús, who grew up here and had the vision to promote and protect his piece of paradise through fun-filled educational experiences. Zipline and see the jungle from up above, ATV or walk through the jungle paths, or swim in a cenote or snorkel in an underground river! It is all here and we guarantee you will walk away with a greater appreciation of this place. If you are a foodie, we highly recommend your checking out The Little Mexican Cooking School. It's right in the heart of Puerto Morelos and only a short walk to the beach. They also have a quaint boutique hotel, Casa Caribe. Maybe Puerto Morelos is a little too quiet for your taste. Well, it is nestled between two thriving cities: to the north, Cancun, or farther south and you will hit Playa del Carmen. Our feeling is that Playa is worth at least a day or two! It is one of the fastest-growing cities in the world! It is a city where you can feel the energy like you have your hand on the heart of the Riviera Maya and you can feel it pulsating. The beach clubs here are alive almost 24/7 with day trippers and night-time dancing and partying. 5th Avenue is a pedestrian street full of shoppers during the day and at night it takes on a totally different feel. It is one of our favorite places to people-watch! Please do us all a favor and don't stop to have your photos taken with the exotic animals. Other than that, eat, drink, dance and shop 'til you drop! Playa is THE place for foodies! You will find everything from Thai noodles, 5-star dining, street food, toes-in-the-sand places to eat, and you can even eat in an underground cave … where many believe the Alux live. And you will find hotels in all kinds of price ranges. We recently stayed at Acanto Hotel and Club Yebo Hotel. Heading farther south, many love the feel of Puerto Aventuras. It is a lovely, gated community with villas, condos and resorts such as the Hard Rock Hotel. Some people are put off by the dolphinarium, which is located in the center of the marina district, but to many expatriates it is home and you will feel the warmth and closeness of this community. Wander the marina and eat and shop; we also recommend you take a sail from here. It is perfect to see this amazing coast from the water. 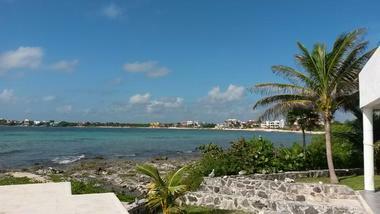 South of Puerto Aventuras is Akumal, Mayan for "place of the turtle." It is a very popular spot for snorkeling, with three unique places to choose from, and great restaurants and shops. We recommend that you wander on both sides of the highway and be sure to visit the two bays and Yal-Ku Lagoon. If you choose to stay here, you will have choices of condos, villas, boutique hotels and all-inclusive. This community has become so popular for day trippers that it is on the verge of threatening its natural resources, so we please ask that you choose a reputable and sustainable way to visit. Our first choice would be to visit as a guest and not for just a few hours. We have stayed and visited a number of Akumal Villas properties and often make Hotel Akumal Caribe a home base. We have eaten at every restaurant—and never have had a bad meal! Not looking to be right on the beach? You may want to consider renting a more reasonable place or house in Chan Chemuyil, which is located between Akumal and Tulum and is within walking distance to a lovely, quiet beach. Two quieter bays to visit are Soliman Bay and Tankah Bay. The roads to these places are still not paved and you won't find speed boats cluttering up the space. These bays have a few small hotels but are mostly private villas. Great location and quiet, peaceful nights! Tulum is the last spot on the Riviera Maya; it ends at the Sian Ka'an Biosphere and the only thing south right on the coast is Punta Allen. Tulum's town is a great place to get a reasonable meal, shop, and get whatever supplies you might need. The beach is considered one of the most beautiful in the world by many well-known travel magazines; it is a must-see. And, on top of all that, there are the Maya ruins! This place has it all. Once known as a hippie/backpacker community, it has turned into a more exclusive spa destination. Most of the hotels are boutique size and you can find something for every wallet. When we go high-end, we love The Beach Tulum; on a budget, Cabañas Tulum is a great choice. Whether you are there for a week or just the day, there are a number of beach clubs to choose from. And, if you are more of a jungle person, we would recommend a wonderful Bed and Breakfast halfway between Tulum and Coba: La Selva Mariposa. We will mention this again in the upcoming Yucatan article. A visit here isn't complete without a tour of the Sian Ka'an Biosphere. If you rent a car, you can travel south of Tulum—the beach road conditions vary depending on the weather; you can also explore south on Hwy. 307. You can enjoy a number of great tours. One of our favorite tours is the Sunset Tour that allows you to float down a pristine ancient canal and take a boat ride to Bird Island, as all the birds flock home to retire for the evening. Then you travel back, watching the sun set with nothing but nature all around! On this peaceful note we will end this article. Coming up, we will explore the Costa Maya and travel inland to the extremely diverse Yucatan Peninsula. Heading south you either continue on 307 to Bacalar and Chetumal, or turn left at Limones and head to the Caribbean Sea to Mahahual and Xcalak. The Costa Maya is a little more than 60 miles long, starting at the southern tip of Sian Ka'an and going to the tip that ends at the opening to Chetumal Bay, a stone's throw to Ambergris Caye. To reach Xcalak you want to turn right before the Pemex station off the road to Mahahual. Xcalak was once a thriving city. 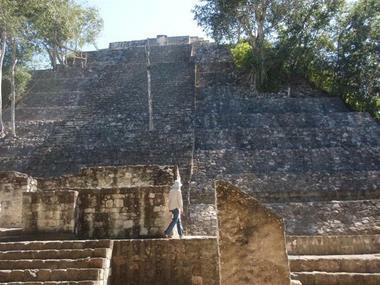 The history, of course, dates back to early Maya but Xcalak in the 1950s was a thriving fishing community with stone and wood homes, electricity, billiard hall, movie theater and more. It was the most important supply destination in the region until Hurricane Janet decimated it in 1955, killing one-third of its inhabitants.